I love Melbourne and the state of Victoria. It’s where I have lived since 1994 and I appreciate it every day. However I have also lived in 3 other great Australian cities in three different states – Sydney in New South Wales, Canberra in the Australian Capital Territory and Perth in Western Australia. In this podcast I would like to tell you a little bit about Perth, which is where I went to University and spent some of the first years of my working life. In fact, Western Australia is also where I was born and lived my early years, so it will always be a special part of Australia for me. Perth is the capital of the state of Western Australia and has a population of around 2 million people. When I was 17 years old I left my family in the south western coastal town of Bunbury and moved to Perth to live in a university college at the University of Western Australia. That was a big thing for me at the young age of just 17. Back then, I thought that Perth was the centre of the universe. Well, not literally, but at that time I had never been to another big city. There is a reason for that. Perth is the second most isolated big city in the world. The nearest big city to Perth is Adelaide in South Australia, which is 2,014 kms away. That’s a long way. In fact, only Honolulu in Hawaii is more isolated than Perth. Because Perth is so isolated, its people know how to have fun in their own city. You can do just about anything in Perth, but it’s most famous for its water activities – firstly in the ocean and at the wonderful beaches which Perth has, and secondly in the river which runs right through the city – the Swan River. What more can one say about the beautiful beaches in Perth? The sand is white and feels wonderful between your toes. The sand and the water is clean and there are waves which roll onto the shore. In addition, the main beaches are most often patrolled by surf lifesavers. The most famous beach in Perth is Cottesloe. In a recent visit to Perth with my family, we went to Cottesloe and had a fantastic lunch at the Indiana restaurant. This restaurant is in a wonderful old building built right on the beach’s edge, with great views along the beach and out to sea. We really enjoyed our visit and it reminded me of my university years when Cottesloe was just a short motorcycle ride down the road from the university college where I lived. Other famous beaches in Perth include Scarborough Beach, Leighton Beach, City Beach and South Beach which is in Fremantle, close to Perth. I have been to Scarborough Beach a few times and it too has great restaurants, cafes and of course the beach itself is excellent. But I think Cottesloe is my favourite. After the beaches, the two things that I love most about Perth are the Swan River and Kings Park. 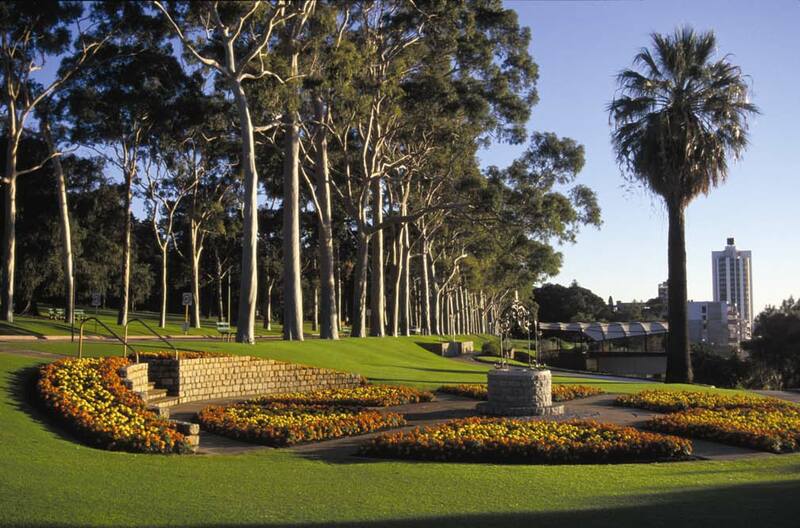 Kings Park is a 4 square kilometre park and is found right in the centre of Perth. It has a mix of natural bushland, beautiful grassed parkland and botanical gardens with a fantastic range of Australian native plants. The thing about Kings Park is that it sits on the top of a hill. This means you have a wonderful view of the city of Perth and the Swan River below. I never get tired of this view. It reminds me again of my years at University when I was lucky enough to have this view just a couple of kilometres from my university accommodation. There are many viewing platforms in Kings Park where you can just take in the view. It’s no wonder that around 5 million people visit Kings Park every year. It’s the most popular tourist destination in Perth. The University of Western Australia is located very close to the Swan River which runs right through the centre of Perth. While it is not a large river, it spreads out a lot as it reaches the centre of Perth and becomes two large waterways called Perth Waters and Melville Waters. At its widest point, Melville Waters is around 4 kilometres across. Melville Waters in particular is a great place for water activities including one of Perth’s most popular pastimes, sailing. I know that stretch of water well. When my wife and I were first married, we owned a small yacht which we sailed on Melville Waters. There are several yacht clubs along the shores of that part of the Swan River and sailing of all types and sizes of yachts is very popular. Our yacht club was called The Perth Flying Squadron Yacht Club, which is a strange name because you think it might be for people who fly airplanes, but it’s a sailing club for everyone. We would often go sailing in the evening on a Wednesday during the summer. It was called twilight sailing and it was great fun. We would start the race at around 5 pm. As it got darker, the city lights across the water were a real sight to see. After sailing around the course in around 2 hours, we would return in time to have a barbeque outside the club rooms. The weather was almost always perfect in summer time for a barbeque. We have great memories of our time in Perth. When talking about Perth, you must also mention the weather. It’s a great climate for an outdoor lifestyle. In February in the middle of summer for example, the average maximum temperature is around 31 degrees C with lots of sun. Even in the middle of winter in July, the average maximum is still around 18 degrees C, which is not that cold. Perth’s weather is perfect for playing sport, getting outdoors and enjoying yourself, although you need to make sure you have a hat and sunscreen for your skin. Even though I love Melbourne, I will always have a soft spot for Perth. Podcast 58 Quiz - Did you understand the podcast? True or False? – Rob has lived in 4 states of Australia. True of False? – Rob went to school in Perth. True of False? – Perth is a long, long way from other big cities. True of False? – Rob had a motorcycle when he was at the University. True of False? – If you want to see a range of Australian Native Plants, you could go to Kings Park in Perth. True of False? – The Swan River is the most popular tourist destination in Perth. True of False? – Melville Waters is where Rob and his wife went sailing at twilight. True of False? – Rob thinks that the Perth weather in winter is not very cold. True of False? – Both Cottesloe Beach and Kings Park remind Rob of his days at University. True of False? – If you write to Rob at rob@slowenglish.info, he will write back to you in English. Go on, give it a try. Write to Rob. He will really appreciate it. It doesn’t matter if you make errors in your English. That’s what happens when you are learning a language, and it’s not important. Give it a try. Thanks a lot for writting about Perth. Now I highly want to be there at the first place! Many thanks for your comment. Perth is certainly a great place to visit. But I think the best way to get there is by airplane. I have never done the trip by train but I think it is certainly more expensive than by air. We are mostly a nation of flyers and don’t use trains very much. That’s a pity really, because, as you say, you get to see more when travelling by train. Many thanks for your message. Yes, Morocco is a long way from Perth. I hope you can visit it one day. Hi Ray. Thanks for your comment. It’s amazing how many common threads there are through our early experiences. I’m glad that it brought back some memories for you.